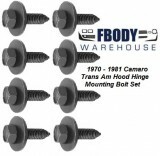 Here you'll find a wide variety of replacement hood, and hood related items for your 1978 1979 1980 1981 Camaro. From hard to find non reproduced Air Induction parts and kits, towasher nozzles and hood lights. We have the parts you need for your late second generation Camaro! As always USA shipping is FREE..
Z28 Air Induction Scoop Mounting Kit 100% Complete! 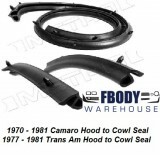 1978 - 1979 Camaro Hood Release Cable Style Used GM! 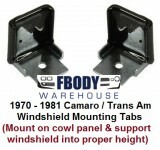 1978 - 1979 Camaro Hood Release Bracket Cable Style Used GM!